Three times this past week, I found myself downtown after 10 pm, looking for a cab to bring me home. And every time, not a single empty cab was to be seen, despite the fact that there are about 18,000 cabs plying our streets and I was waiting at visible locations in the heart of town. 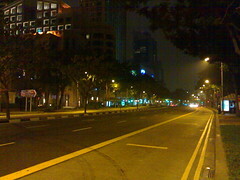 Welcome to the impossibility of getting a cab in Singapore in the late evening. You see ah, we change shift at about 5 pm. That’s peak hour, everybody going home from work, so we drive for a few hours. Then we want to make sure we drive from midnight onwards, can earn from the midnight surcharge. So the only time we can take a break is after peak hour — 9, 10 pm. Go and makan [eat] with friends, then be back on the road before midnight. I don’t blame cab drivers for wanting to take a break before trying to hit the midnight jackpot (cab fares go up by 1.5 times between 12 am and 6 am), but that doesn’t mean they should all vanish off the streets, right? Which landed us in our current situation: where there are cabs galore from 11:30 pm onwards, but not a single one to be had an hour before. Sure, you can get one if you call a cab company, but that incurs yet one more surcharge. It’s gotten to a point where, if I can afford the time, I’d rather sit and pay instead for one more drink to last till 11:30 pm. Unfortunately, I couldn’t afford that time this week. On Tuesday and Thursday in the Hill Street/Victoria Street area, I caved in after waiting for 10-15 minutes and ordered a cab. On Wednesday, off Boat Quay, I lucked out when a cab dropping off a passenger was willing to pick me up next. Note to self: devise new schedule that doesn’t entail waiting for a cab between 10 and 11 pm.